Isola manufactures prepreg and Copper Clad Laminates (CCL), the primary materials used in the construction of multilayer printed circuit boards. Prepreg is an industry term derived from the contraction of ‘‘previously impregnated’’. Prepreg is a dielectric material that provides electrical insulation and other properties. Prepreg is manufactured by the impregnation of fiberglass fabric with specially formulated resins. The resin confers specific electrical, thermal and physical properties to the prepreg and is critical to the proper functioning of a PCB. Prepreg may be incorporated into a CCL or sold as a separate product. CCL consists of an inner layer of prepreg laminated on both sides with a thin layer of copper foil. The lamination is achieved by pressing together one or more plies of copper and prepreg under intense heat, pressure and vacuum conditions. 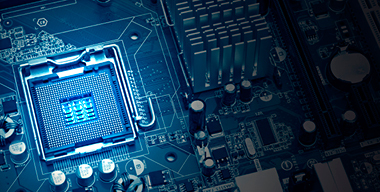 PCB fabricators use prepreg and CCL to construct multilayered PCBs in a complex process comprised of multiple operations that are often repeated. In general, the copper surfaces of the laminate are etched to create an electronic circuit. These etched laminates are assembled into a multilayer configuration by inserting one or more plies of insulating prepreg between each etched laminate. Holes are then drilled and plated in the PCB to establish electrical connections among the layers. The resulting multilayer PCB is an intricate interconnection device on which semiconductors and other components are mounted, which is then incorporated into an end-market product.